My goodness, it is nearly Turkey Day! I am not sure where the year went, I feel like I just took down the Christmas tree, yet I find myself at the starting line for another holiday season. With most holidays I start my planning with the menu. This year my mother is hosting Thanksgiving at her house. For my mom Thanksgiving is all about tradition. If it were up to her we would have the exact same meal year after year. It is a lovely meal, filled with delicious dishes that I look forward to and remember fondly from childhood, but I also like a little variety. My mom and I split the cooking for Thanksgiving, and I usually end up with a few side dishes, bread, and desserts. This year I plan to show up with my share of the cooking … and something unexpected! 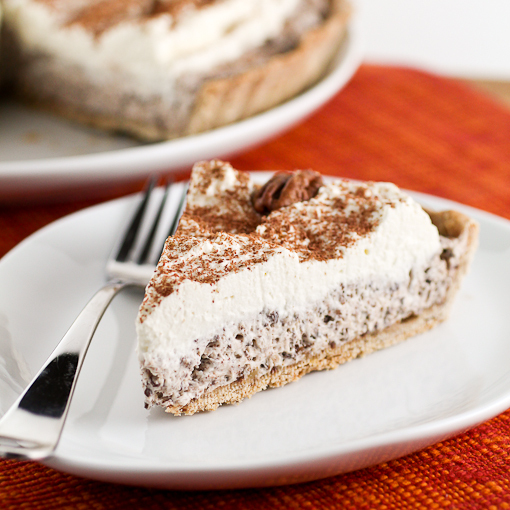 That’s right, I am shaking up dessert with this creamy, rich, utterly EASY tart. I do not think anyone will mind! When it comes to Thanksgiving desserts I like them to be easy, I like them to be make-ahead friendly, and they have to taste fantastic. This tart is all of those things! A good tart starts with a good crust. 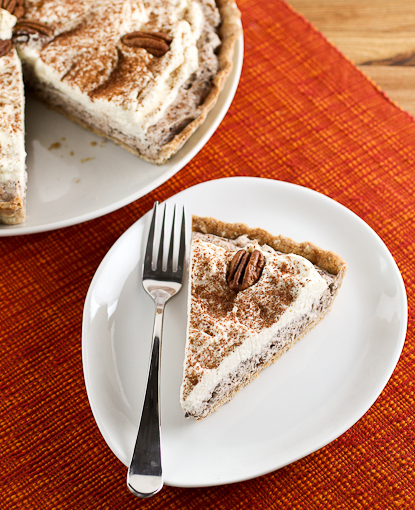 Here the crust made with ground pecans and cinnamon to give the tart some seasonal warmth. It is similar in flavor to pecan shortbread – very buttery and toasty. The filling is a mixture of tangy cream cheese that is lightened up with fluffy whipped cream and a touch of hazelnut liqueur. To gild the lily even further chopped toasted pecans and grated bittersweet chocolate are folded into the cheese mixture. It is Thanksgiving after all! Topping it all off is a cloud of sweetened whipped cream, toasted pecan pieces, and more grated chocolate. 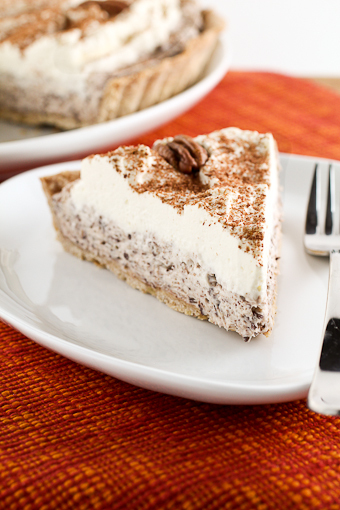 It looks and tastes like you slaved over this dessert, but it is so easy! If you want you can substitute almonds or even walnuts for the pecans. You can customize this any way you want! It is sure to be the hit of your Turkey Day table! 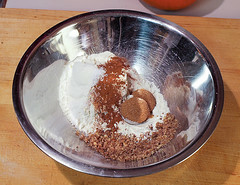 In a medium bowl combine the flour, ground pecans, sugar, and salt. Whisk to combine. 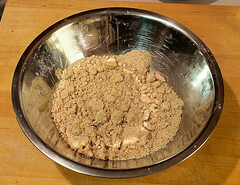 Add the cubed butter, and with your fingers, rub the butter into the flour until the mixture looks like coarse sand studded with a few pea sized pieces of butter. Add the water, starting with 3 tablespoons and adding more a teaspoon at a time, and mix with your hands until the dough forms a shaggy ball. Turn the dough out onto a surface dusted lightly with flour and knead the dough by flattening the dough with your palm and then folding the dough in half. Repeat this process 5 to 6 more times, or until the dough forms a smooth ball. Wrap the dough in plastic wrap and chill for 30 minutes. Once chilled remove the dough from the refrigerator for 10 minutes. On a lightly floured surface knead the dough two or three times then roll out until the dough forms a 14-inch circle about ⅛-inch thick. 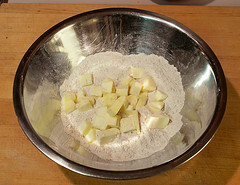 Transfer the dough into an 11-inch tart pan and press the dough into the pan. Be sure not to stretch or pull the dough. Use the edges of the tart pan to cut off the excess dough. Line the pan with foil and fill with baking beans or pie weights. Bake for 12 to 15 minutes, or until the dough is set. Remove the pie weights and the foil and bake for an additional 10 to 15 minutes, or until the crust is golden brown all over. Cool completely to room temperature. 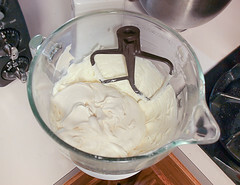 In the work bowl of a stand mixer fitted with the whip attachment, or in a large bowl with a hand mixer, add 1 cup of the cream, ½ of the powdered sugar, and the vanilla. Whip until the cream forms medium peaks. Set aside. 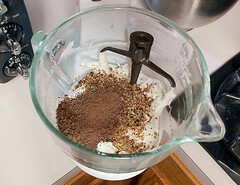 In a separate bowl of a stand mixer fitted with the paddle attachment, or in a large bowl with a hand mixer, add all but 1 tablespoon of the remaining powdered sugar, cream cheese, and hazelnut liqueur. Beat on high speed until the cream cheese is light and fluffy, about 3 minutes. Add the whipped cream and beat on medium speed until thoroughly combined, about 1 minute. Add the chopped pecans and grated chocolate and mix to combine. Spread the filling into the cooled crust. Cover with plastic and chill for at least 4 hours or overnight. When you are ready to serve whip the remaining cream with the reserved tablespoon of powdered sugar until it forms firm peaks. Spread the cream over the tart. 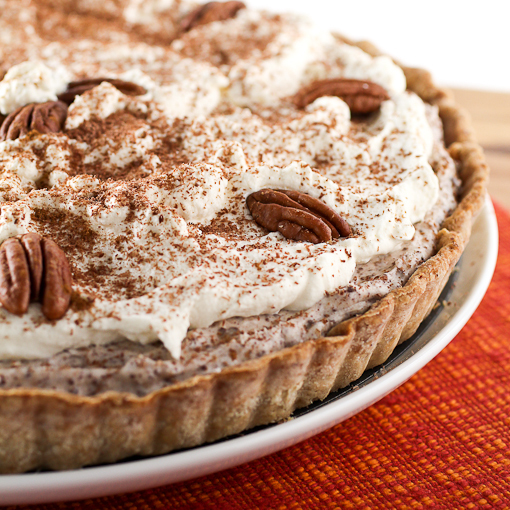 Place the pecans around the outside of the tart and dust with the shaved chocolate.